Greece is located in southern Europe. Greece is bordered by the Aegean Sea, Ionian Sea, and Sea of Crete; Albania, Republic of North Macedonia, and Bulgaria to the north; and Turkey to the north and east. 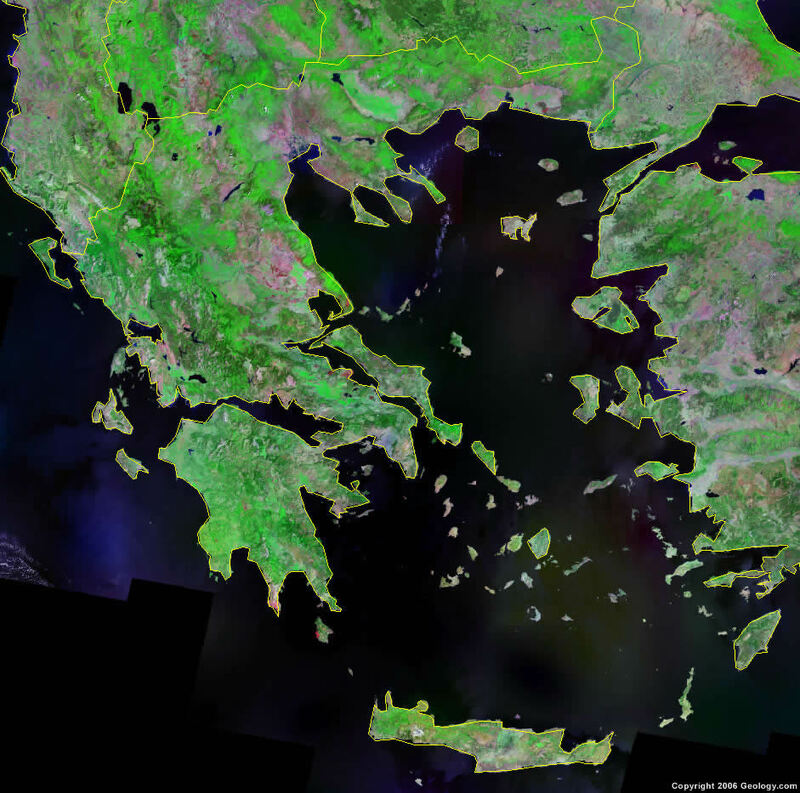 Google Earth is a free program from Google that allows you to explore satellite images showing the cities and landscapes of Greece and all of Europe in fantastic detail. It works on your desktop computer, tablet, or mobile phone. The images in many areas are detailed enough that you can see houses, vehicles and even people on a city street. Google Earth is free and easy-to-use. Greece is one of nearly 200 countries illustrated on our Blue Ocean Laminated Map of the World. This map shows a combination of political and physical features. It includes country boundaries, major cities, major mountains in shaded relief, ocean depth in blue color gradient, along with many other features. This is a great map for students, schools, offices and anywhere that a nice map of the world is needed for education, display or decor. If you are interested in Greece and the geography of Europe our large laminated map of Europe might be just what you need. It is a large political map of Europe that also shows many of the continent's physical features in color or shaded relief. Major lakes, rivers,cities, roads, country boundaries, coastlines and surrounding islands are all shown on the map. Agrinion, Aharnes, Alexandroupolis, Amfissa, Argostolion, Arta, Athina (Athens), Corinth, Drama, Edhessa, Edirne, Florina, Gianitsa, Greyena, Igoumenitsa, Ioannina, Iraklion, Kalabaka, Kalamata, Kallithea, Kardista, Karpenision, Kastellion, Kastoria, Katerini, Kavala, Kerkia, Khalkis, Khios, Kifissia, Kilkis, Komotini, Kozani, Lamia, Larisa, Levadhia, Levkas, Mandra, Megara, Mesolongion, Messolongi, Mitilini, Navplion, Orestias, Patra (Patrae), Piralevs, Pireas (Piraeus), Pirgos, Poliyiros, Preveza, Ptolemaida, Rethimnon, Rodhos, Salamina, Samos, Serrai, Sitia, Sparta, Thessaloniki (Salonica), Thivai, Tirnavos, Trikala, Tripolis, Veroia, Volos (Iolkos), Xanthi and Yithion. Aegean Sea, Amvrakikos Kolpos, Ionian Sea, Limini Himaditida, Limni Amvrakia, Limni Ioaninon, Limni Kastorias, Limni Kerkinis, Limni Koronia, Limni Mikri Prespa, Limni Petron, Limni Trihonida, Limni Vegoritida, Limni Volovi, Oros Parnonas Mountains, Oros Taigetos Mountains, Pindos Oros Mountains, Sea of Crete, Strimonas River, Struma River, Thermaikos Kolpos, Vardar River and Vjose River. Greece has fuel resources which include lignite, petroleum, and the potential for hydropower. Mineral resources include iron ore, bauxite, lead, zinc, nickel, magnesite and salt. Marble is also a resource. The natural hazards which occur in Greece include severe earthquakes. The country of Greece has environmental issues which include air pollution and water pollution.